1. There are four different race distances for all ages and levels. You don’t have to be a seasoned marathoner to participate! UGM is a great family event, and even parents with strollers can join in the fun. In addition to a full marathon, the UGM course also offers half-marathon, 10K, and 5K sub-divisions. Prizes for the top three finishers range from $100 to $1,500, and the 1st place marathon prize includes an airline ticket to or from Guam, courtesy of United Airlines. The 5K is open to all ages, the 10K is open to ages 13 and up, and participants must be at least 14 years old to run the marathon and half-marathon. All runners 17 years old and below must have parental/guardian approval to participate. 2. All four race courses will begin and end in Tumon. Runners will be able to enjoy scenic ocean views for much of the out-and-back course as they make their way down Marine Corps Drive through the villages of Tamuning, Hagåtña, Asan, and Piti. All courses begin and end in front of the Guam Visitors Bureau headquarters by Ypao Beach Park in Tumon. The racecourse stretches from there to the T. Stell Newman Visitor Center in Sumay, near the front gates of Naval Base Guam. 3. There will be aid and refreshments along the course. i (a local dessert made from tapioca and young coconut meat). There will also be course marshals from the Guam police and fire departments out on the course to assist any runner in need. Restrooms will be available along the course and can be located on the racecourse map, which can be found at http://unitedguammarathon.com. 4. There will be a celebration at the end. All runners will receive a finisher’s certificate and medal. 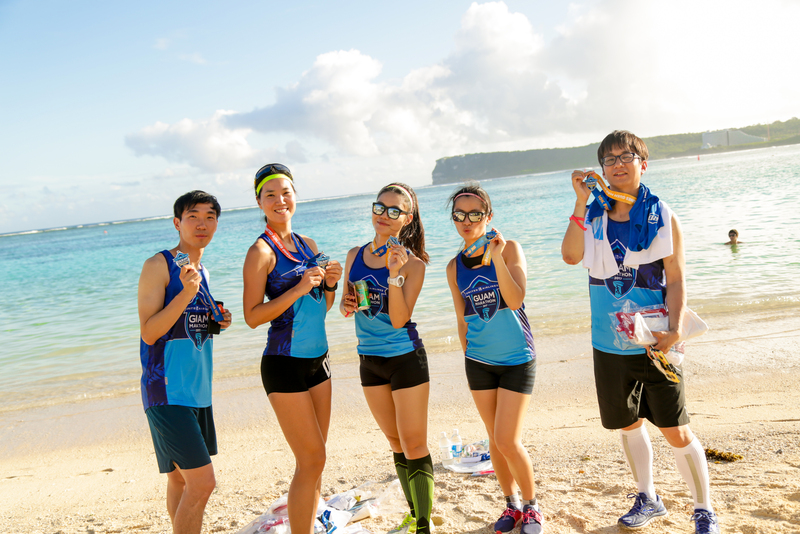 After crossing the finish line, participants can run down a carpeted path that will take them right to the beach where they can kick off their shoes and join in the Tumon Bay Dip—the most refreshing end to a marathon ever! The post-marathon celebration kicks off with UGM’s newest feature: the BBQ Beach Party. Marathon participants and their families can enjoy local food and drink concessions, take epic beach photos, enjoy live music and other entertainment, and play beach games. The BBQ Beach Party begins at 6:30 a.m. Runners will be able to relive the memories of the day by viewing pictures on United Guam Marathon’s Facebook page. 5. The event will welcome thousands of participants from around the world. The United Guam Marathon draws a big multicultural crowd, with half the participants being local and the other half visitors. This year’s event is expected to draw 5,000 participants from Guam and 16 countries around the world including Japan, Korea, Hong Kong, Taiwan, and the Philippines. 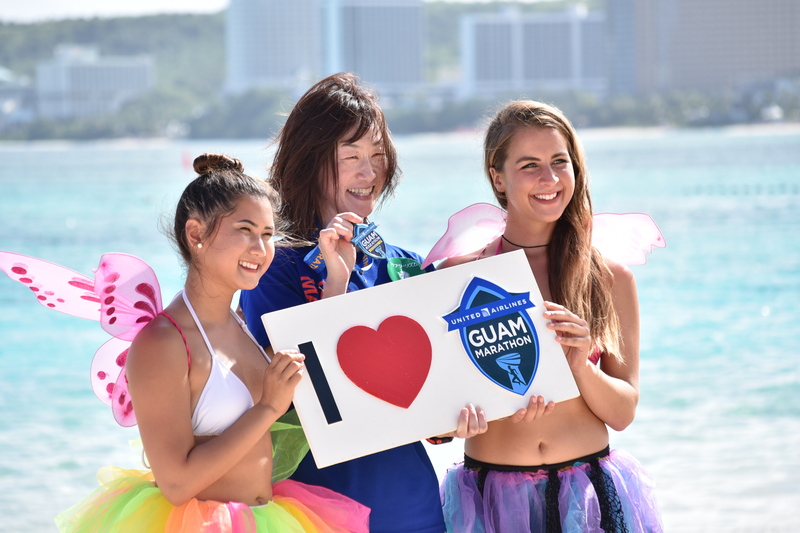 The United Guam Marathon will bring fun and the kindling (or rekindling) of friendships on race day, as well as a chance for visitors to experience running along the island’s coastal waters. 6. There is still time to sign up (but you should hurry). It’s best to register soon, as registration fees are increasing as race day approaches. Sign up for the 5K, 10K, half-marathon, or full marathon at http://unitedguammarathon.com/register-now, or visit the front desk at the Pacific Island Club (PIC) in Tumon. Registration will close in about a month! But don’t worry—there’s still time to plan your visit Guam and experience running in paradise.